Mount Vesuvius is certainly the symbol and the main feature in the Neapolitan landscape, and it is one of the smallest active volcanoes in the world (1277 mt high). It consists of a truncated cone, Monte Somma, which rises to the height of 1152 mt in punta Nasone, on the Northern side. From the centre of this crater Vesuvius proper rises. Austere and all yellow with broom in spring, it inspires a mighty solitude just as the poet Giacomo Leopardi described it. This famous volcano was responsible for the destuction of Pompeii, Herculaneum, Stabiae and so on. On the 24th August of 79 A.D. it erupted and, over the centuries, even the memory of their exact location was lost. For more than 1500 years Pompeii has been buried undisturbed beneath heaps of ashes and cinders until it was rediscovered in 1748. Among the most significant aspects of the discoveries at Pompeii is the remarkable degree of preservation of the ancient objects. The showers of wet ashes and cinders that accompanied the eruption formed a hermetic seal on the town, preserving many public structures, temples, theaters, baths, shops, and private dwellings. As regards Herculaneum, a huge pyroclastic muddy flow flooded the town and when it hardened it became solid as rock. For more than 1500 years this town too has been preserved undisturbed and its excavations began quite by accident in 1709 when during the digging of a well, some workers discovered a wall which was later found to be one of the stages of the ancient theatre. Initially a series of tunnels were dug to strip the site of any saleable valuables. Officially the excavations of Herculaneum started in 1738 by will of the king of Naples Charles of Bourbon under the supervision of Rocco Gioacchino Alcubierre and then his assistant Carlo Weber. Over the centuries Mount Vesuvius has erupted many times: the last eruption took place in 1944 during the second world war and two villages (San Sebastiano al Vesuvio and Massa) were destroyed. Since then, the crater has lost its plume of smoke, and only very few minor fumaroles give warning that Vesuvius is still alive. Before 79 A.C. the lower slopes of Mount Vesuvius were planted with vineyards. Pliny the elder wrote that no region on earth was more joyously touched by nature. Its volcanic nature was unsuspected save by men of science such as Diodorus Siculus, Vitruvius and especially Strabo, who inferred its igneous nature from its conical shape and the ashy nature of its barren summit. In early times – he wrote – this district was on fire and had craters of fires, and then because the fuel gave out, was quenched. (Geography, V, 4). 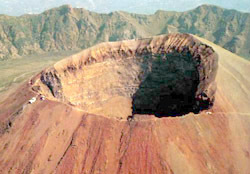 The name “Vesuvius”, or “Vesbius”, has been derived from two roots meaning “the unextinguished”. This peak was much higher than the present summit, and was the completion of the now broken cone of Monte Somma. Within its seemingly dead crater Spartacus and the rebel slaves took refuge in 73 BC, escaping by an unguarded rift from the besieging army of Clodius Pulcher. In 63 AD a violent earthquake , mentioned by Seneca, caused serious damages in Pompeii, Herculaneum, Naples and Pozzuoli. This was followed by other shocks, and in 79 AD the central cone blew out and Pompeii, Herculaneum and Stabiae were totally buried. The eruption is vividly descibed in two letters written by Pliny the Younger and sent to Tacitus. According to the Pliny’s description Vesuvius erupted stones and sand like a pine tree, for it shot up a great height in the form of a trunk, which extended itself at the top into several branches. Besides he wrote: It was now six o’clock in the morning, the light still ambiguous and faint. The buildings around us already tottered, and though we stood upon open ground, yet as the place was narrow and confined, there was a certain and formidable danger from their collapsing. It was not till then we resolved to quit the town. [ ] The coaches which we had ordered out , though upon the most level ground, were sliding to and fro, and could not be kept steady even when stones were put against the wheels. Then we beheld the sea sucked back, and as it were repulsed by the convulsive motion of the earth; it is certain at least the shore was considerably enlarged, and now held many sea animals captive on the dry sand. On the other side, a black and dreadful cloud bursting out in gusts of igneous serpentine vapour now and again yawned open to reveal long fantastic flames, resembling flashes of lightning but much larger. [ ] We had scarce sat down, when darkness overspread us, not like that of a moonless or cloudy night, but of a room when it is shut up, and the lamp put out. You could hear the shrieks of women, the crying of children, and the shouts of men; some were seeking their children, others their parents, others their wives or husbands, and only distinguishing them by their voices; one lamenting his own fate, another that of his family; some praying to die, from the fear of dying; many lifting their hands to the gods, but the greater part imagining that there were no gods left anywhere, and that the last and eternal night was come upon the world.